Presented in easy-to-use, step-by-step order, Pipeline Rules of Thumb Handbook is a quick reference for day-to-day pipeline operations. 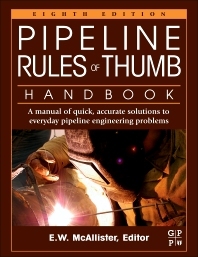 For more than 35 years, the Pipeline Rules of Thumb Handbook has served as the "go-to" reference for solving even the most day-to-day vexing pipeline workflow problems. Now in its eighth edition, this handbook continues to set the standard by which all other piping books are judged. Along with over 30% new or updated material regarding codes, construction processes, and equipment, this book continues to offer hundreds of "how-to" methods and handy formulas for pipeline construction, design, and engineering and features a multitude of calculations to assist in problem solving, directly applying the rules and equations for specific design and operating conditions to illustrate correct application, all in one convenient reference. Please feel free to visit the site: http://booksite.elsevier.com/9780123876935/index.php, and we hope you will find our features as another useful and efficient tool for you in your day-to-day activity. E.W. McAllister has more than 50 years' of experience in the pipeline industry as an engineer, administrator, and project manager. He has worked for Chevron Pipe Line Company and Gulf Pipe Line Company, and now runs his own engineering services consulting firm in Houston, TX, USA. I am a gas design engineer. I only have to pull this book out every once in awhile, but when I do, it is very helpful. Excellent book, sits on my desk as a reference. I very rarely need it, but when I do, I’m glad i’ve got it.